People are naturally drawn to stories. It’s one of the greatest things we can do as a species. Passing on information, both real and imagined, from one person to another. It’s what connects us all. There’s real magic in that. I enjoy feeling my way through a story, trying to understand the rhythm and flow of it and where it connects to people. I love to make works for young people because they are still filled with hope for the future and a wonder of life. Because they are the most important people in the world and deserve our respect and best efforts. I had many favourite childhood books. Some of my favourites in the house were the haunting La Corona and the Tin Frog by Russell Hoban and Nicola Bayley, the ethereal Rabbits Wedding by Garth Williams, the mind-bending Maui series by Peter Gossage and numerous hilarious books by Richard Scarry. The biggest book influence on my creative life would have to be Calvin and Hobbes by Bill Watterson, a singularly, spectacular work that somehow manages to capture the inane and the divine all at once. I have a little image that I use as my stamp, which has a Thylacoleo skull on it. The Thylacoleo is one of my favourite animals. It was a prehistoric, carnivorous marsupial that lived in Australia, about the same size as a jaguar. It would have preyed on other prehistoric animals such as Diprotodons and giant kangaroos. The Thylacoleo makes me think about how much our world has changed, how many different shapes it’s taken and how many mysteries there are still to be uncovered. I’ve travelled around a fair bit to various festivals and sites; however, one of my favourite trips was last year. I attended the Comic Art Workshop in Indonesia, where 18 comics makers came together to spend two weeks workshopping our books. It was an amazing experience to be around so many people who deeply understand comics making and be a part of their development process. Be the kindest person you can when dealing with others and the strongest person you can when advocating for your work. I like to think there’s a playfulness and experimentation in all my projects. I co-run the children’s art school, milktooth, with my amazingly talented wife, Elizabeth Marruffo, where I teach comics-making workshops. I also work at the Western Australian Museum where I develop fun interactives and programs for families. When not doing those things, I like playing with my son and our dog, making up games and exploring parks. Ideas are all around, in the most mundane of places. I draw a lot from my own childhood and use memories of people and places as the foundation for most of my work. I am really inspired by popular culture, such as video games, comics, movies, cartoon series and so on, reimagining them as personal stories. Of course I’m always inspired by the other amazing creative people in Perth. There are so many incredible storytellers and illustrators here. Most importantly, I always credit who is influencing me, to pay respect to their hard work. When the deadline hits. Otherwise I could keep reworking stories forever. Want to make your own comic with Campbell at the festival? You can buy tickets for his workshop, How to Make Your Own Comic, here. 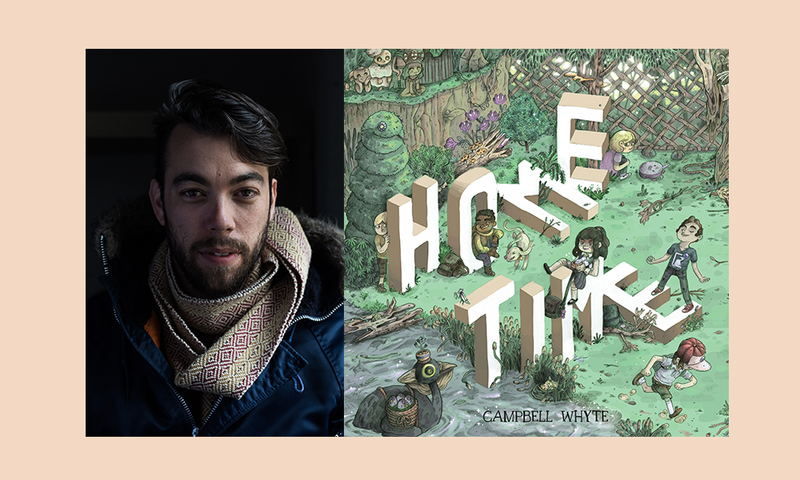 You can also catch Campbell at our special evening event, For The Grown-Ups, where he'll be a panellist at Through a Visual Lens (Thursday 10 May).